Also known as custom-fitted “shells,” porcelain veneers are attached and bonded to the front surfaces of the teeth in your smile “zone.” Teeth that are badly stained, chipped, gapped or crooked can be easily corrected with porcelain veneers, which can be used as a part of a complete smile makeover. What Are Some of the Benefits of Porcelain Veneers? So you can be assured that your veneers will look and feel natural, you will meet with one of our dentists for a discussion. They’ll determine the look that you’d like to achieve and assess your teeth to make sure veneers are appropriate for your smile needs. Your dentist will gently sand the enamel on the teeth that will be fitted with veneers; doing so is essential to achieve the same tooth thickness. An impression of your teeth is then taken so the veneers can be shaped for a precise fit, with the desired colour and shape. 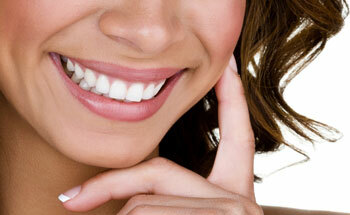 We can place temporary veneers on your teeth while your permanent ones are being crafted. At this follow-up appointment, you will approve the colour and shape of your new veneers before your dentist bonds them to your teeth. First, your dentist will clean your veneers with a mild acidic solution before a tooth-coloured bonding agent is applied to cement your veneers securely in place. Lastly, your veneers will be buffed, so they blend in with your other teeth seamlessly. If you’d like to transform your smile with porcelain veneers, contact The Smile Factory today to book a consultation with one of our dentists!